Last week the Internet Archive announced a partnership with NASA (nasaimages.org) which provides searchable access to video and still images from NASA's vast archives. 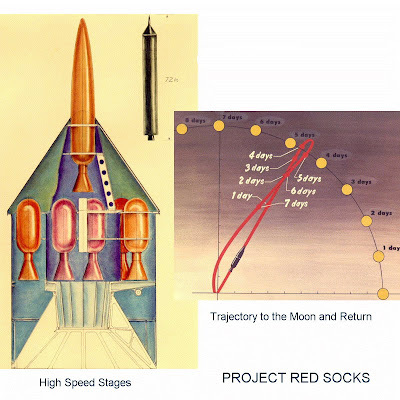 Above is a 1957 artist's rendition of Project Red Socks, which was to be the "world's first useful moon rocket." NASA and Internet Archive, a non-profit digital library based in San Francisco, made available the most comprehensive compilation ever of NASA's vast collection of photographs, historic film and video Thursday. Located at www.nasaimages.org, the Internet site combines for the first time 21 major NASA imagery collections into a single, searchable online resource. A link to the Web site will appear on the www.nasa.gov home page.